J. C. Conine was part of the American rural tradition. In Ohio, Iowa, and Washington he lived in the countryside on a farm. That scene in America was becoming less prominent during his lifetime, but his was never an urban life. In Yelm, farming would be the major source of employment during Conine’s life there. J. C. Conine’s story provides a window into forty years of farming in Thurston County. 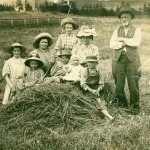 The Conine place was at one time one of the finest in the northwest and provided hay and range for a large number of cattle, both beef and dairy. The place has a lot of bottom land on it and grows plenty of hay. We had to hustle home from school to weed the garden, dig spuds, pick apples and berries, help top and load wagons with beets and carrots for the cattle in winter, help milk, get wood, get the rutabagas and cabbage in for winter, make sour kraut and such like. Mamma used to knit socks and stockings, make us shoes and get the vine maple to make pegs to tack the soles on with. If a sheep died we would pull the wool off, wash it and card it by hand to make quilts, also some carpet rags for carpets. Mamma would weave the carpet. Had straw under the carpet and also straw ticks or feather ticks for our beds. Back then vegetables came from your own garden. “We have a garden of about 4 acres and it is pretty good. We have corn, carrots, beans, peas, potatoes, beets and onions galore,” concluded a satisfied farmer Conine. We are having a very wet Spring but not cold—haven’t plowed a furrow yet but have slashed 15 acres. The trees are leafing out nicely but it has been awful wet. We have had only two days without rain in 6 weeks and that was yesterday and today. It has rained nearly everyday for a month. The grain and grass on the upland looks fine. Lee could just as well have had 20 acres in fall grain as not, and it would have been growing while waiting for the bottom to dry. We have had no rain since the 29th of June and no prospect yet the crops are fairly good and harvesting about done; they are thrashing on the prairie and are getting their second cop of clover thanks to the irrigation. The weather is very hot but it don’t seem to hurt me about work and I do as much as any of ‘em. We have had some fine rains recently and the weather is perfect, not a particle of frost yet. Oh, I forgot to tell you, McKenzie had quite a loss while thrashing. The straw caught fire and burnt his barn and $2000 worth of grain and Anderson’s separator, no insurance. The weather is cool and cloudy but no frost yet, the prospect for fruit was never better. J. C. Conine chose land, in the center of which, was an enormous swampy area, extending ___ miles and covering 20 to 30 acres. At the heart of this swamp ran Yelm Creek on its way to the prairie and the Nisqually River. One man’s swamp, however, is another mammal’s beaver pond. As Conine recalled quite vividly, it took six years to pull down the beaver dam. In doing so, Conine was beginning to alter the ecology of the creek. That beaver dam must have been an impressive site for anyone, particularly someone from the plains of Iowa. Beaver, often anthropomorphized as “industrious” and “eager,” found nourishment in the leafy parts of trees, the bark of aspen and poplar, and aquatic plants and the back-up of water created a perfect petri dish for them. Settlers were often astounded, possibly even impressed by the scale of dams, some reported to be four hundred, even eight hundred feet long and taller than a man standing. Prodigious loggers, a single beaver could take down a six inch thick tree in an hour. The basin created behind the dam attracted waterfowl and birds, lured by insects which thrived in the swampy environment. A variety of forest animals afoot in the area, bears, elk, deer, and the predators which stalked them, came to the pond to drink. Such facts, however, were far from Conine’s mind when he appraised the site and the work that was ahead of him. As he unraveled the network of branches, mud, and anything else that had been dragged to the dam, was he cognizant that beneath the surface of the water was a nutrient filled muck which would be transformed into lush meadows? One early settler gushed, “The beaver prepared the way for forests and meadows, orchards and grain fields, homes and schoolhouses.” Conine was not sensitive to the beaver as a harbinger of civilization, instead he focused on what had to be done. Other forces were at work on Yelm Creek. Further up and along the creek, trees were coming down as settlers cashed in their flora for dollars. This too was changing the creek by removing the “Roots system of streamside trees [which] spread like fingers to grasp and hold the soil, preventing erosion and silting that could smother eggs or choke off the air and food sources that fry and mature fish need to survive.” Decreased roots meant faster and greater run-off. Greater run-off meant more silt and more silt meant spawning beds were being covered downstream. Logging also meant there were less decomposing needles and leaves in the creek. The salmon’s food web began to shrink. Conine and his neighbors were not worried about salmon; they were concerned about creating fields, gardens, and pastures. The ground over which we walked was a perfect carpet of flowers. Conspicuous among these were the beautiful rhododendron with its rich cluster of blossoms, the blue flowers of the camonass, the bright red of the bartisa and columbine. The white blossom of the fragrant seringa, the variegated lupine, the purple of wild peas and iris inter-making a floral display equal to any I ever witnessed in California and one that would delight the heart of every true lover of nature. This was not, however, a truly natural scene. Nisqually people had been tinkering with the prairie for some time with fire. Fire increased the production of tarweed seeds, hazelnuts, wild onions, wild carrots, bracken, and camas. It stimulated berry patches for three good harvests before pickers learned to move on to other thickets. Certain types of ferns grew on prairie, some extending their fronds eight feet from the base. Oak trees became more productive as a result of burning practices. 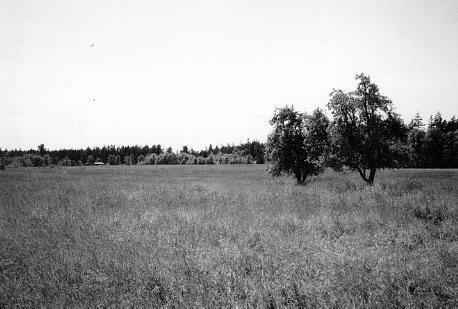 The “burns,” usually conducted in August, meant a larger grass crop, perfect for Nisqually horses. The prairie environment was going to experience profound changes. The Medicine Creek Treaty had created reservations for the Nisqually and though it promised them the right to access old grazing and gathering grounds, in practice, less and less of this land was available. In addition, new settlers meant opponents of burning the prairies. The practice just seemed dangerous and by the time of Conine’s arrival the practice was becoming a distant memory. Fire was to be reserved for other purposes. Whereas the prairies were no longer to be burned, mountainous slash piles in the forests were to be torched. Native diets began to change as hogs rotted out camas and ate acorns. Trees began to slowly move into the prairie. Less burning probably resulted in increased numbers of pests, like grasshoppers. After forty years of farming in Washington, J. C. Conine could still work himself into quite a lather when it came to weeds. I have been knocking hell out of mustard in the potato and turnip patches. I would have to invent a new vocabulary of language to express my opinion of the d—d stuff. It persists in reproducing itself like all worthless trash. Little did he know how accurate his rant actually was. The human imprint on the prairie was changing. This time, however, digging stick and fire, were being replaced with plow and hoofed animals. When J. C. Conine punctured the grasses with the blade of his plow, he was attempting to break through a network of roots which had remained undisturbed for decades. Back in Iowa, a similar disruption of prairie grasses had been described as creating a tremendous ripping sound. Whether or not the sound reminded Conine of his agrarian roots back east, the process in the Washington Territory was proving to be no easier. In fact, others in the area often used multiple yoke of oxen to drag their plow through the unyielding roots, whether they be those of trees of bracken. Merely to create a vegetable garden for consumption at home, required this type of tedious labor. To make matters worse, plowing did not kill the plant, rhizomes simply grew out of the split roots. Everywhere around the Yelm prairie farmers were tearing up grass or leveling forests. In the process they were unknowingly opening vast swaths of land for what are now referred to as “invasive species.” Then, they were simply known as weeds. Bare ground, whether it was an out of season garden, a wagon path, or a railroad bed, or freshly tilled ground said welcome to a host of newcomers to the area. One author termed weeds as “not good or bad; they are simply the plants that tempt the botanist to use such anthropomorphic terms as aggressive and opportunistic.” European species of plants had first shown up in the mid 1700s in California. By Conine’s time, hundreds of new plant species had found their way to Washington. They traveled in ballast water, folds of clothes, or in wagon boxes. They were deposited through animal dung, fell from the coats of animals, or landed in a clump of mud. Bags of seed, so treasured by farming newcomers, contained thousands of seeds which were not intended for careful tending and harvesting. Conine wrote, “I have always noticed that the most worthless thing on earth is the most prolific” and the power of regeneration of these newcomers was remarkable. Some could propagate in six different ways. They might reseed by sticking to one’s pants or have their filaments float in the air. Others formed pods and exploded. A single plant might yield 13,000 seeds, of which 60-90% might germinate, while other seeds might take forty years before sprouting. Weeds are very combative. They push up through, shade out, and shoulder past rivals. Many spread not by seed as much as by sending out rhizomes or runners along or just below the surface of the ground from which “new” plants sprout. Another concluded, “Weeds sprout early and seize the bare ground. Direct sun, wind, and rain do not discourage them. . . They grow fast, seed early, and retaliate to injury with awesome power. One’s field of grain lost value due to large numbers of these weeds being harvested along with the oats. For a half century to come J. C. Conine battled his new, noxious, neighbors. Whether desired or despised, however, most native species faced reduction in habitat and population. . . Native species were shot for food and sport . . . .or because they threatened the domestic species. The worm or snake fences that were used in the area at that time were no barrier to the hungry deer and elk, which munched on garden crops or reclined in fields of grain. There days were numbered. 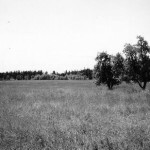 More than a decade before J. C. Conine arrived in Yelm the Washington Standard sadly reported, “The natural grasses as destroyed by being tramped for years. See the bare hills and valley now! 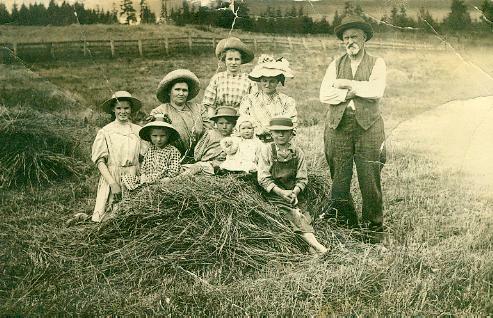 Stock can just get grass enough to keep alive.” As he developed his ranch, Conine slowly added more sheep and cattle. Hogs, which Conine described as a form of frontier currency, were undoubtedly a part of this animal mix up on the Conine ranch. These congregations of domesticated animals were tough on nature. Bunchgrass never had a chance. Animals blazed their own particular paths from meadow to meadow, killing grass in the process. The heft of the animals helped granulize the soil making it less likely to hold water, evaporation rates increased, the grass becoming more vulnerable in the summer. The loss of native grass, which had sometimes been harvested like hay, meant that ranchers like Conine had to dedicate more land to hay production or some type of grass import. Sheep, the “hoofed locusts” which John Muir so roundly condemned, took grasses down to the ground level. Hoofs chipped out roots. The refreshing waters of Yelm Creek began to have its chemistry altered by the urine and excrement of Conine’s herds and flocks; the ecological evolution of the Yelm region continued. J. C. Conine had learned from his experience with the beaver dam. You didn’t want your creek backing up and flooding productive land; you had to bust it up. Yelm Creek invariably filled with downed limbs creating a mother nature’s splash dam. “I have been working in the creek as usual at this time of the year and I find that I don’t get away this month as I know it won’t be done if I leave it. I am satisfied Lee didn’t clean out the jams last fall and it must be done.” Working in the creek “my boots leaked. Result, I didn’t sleep much on account of cramps in my legs. I realize I am too old for that kind of work but what can a fellow do?” He was 78. Farmers often tried something new to make money, a kind of diversification. [They] are going into the chicken and goose business. No doubt they’ll raise more hell than poultry. One can never tell. He built a new chicken house the past winter and paid a hand a hundred dollars for doing comparatively nothing. It appears that the Conine ranch in 1917 was complete with a house, several barns, a house water tower, wood shed, and well house. Writing then Conine complained that he had turned over a ranch with all of the above built and in good condition and the ditches in good shape. Looking around him Conine regretted his decision to rely on Lee. I don’t believe I ever saw a place run down like this. The orchard fence is all rotted down. The boards buried in the ground and grass at least a ton of hay wasted around where the old house you were born in wasted. He don’t seem to understand that decay is going on all the time and repair necessary. I am completely discouraged. We need a new grainery and a shed for tools and implements. The old wood-shed at the old house is about rotted down where we’ve been keeping the implements and the fence posts are beginning to fall with rot. Eternal vigilance is necessary to keep things straight. Your mother and I worked for many years and economized in every way to build up a home with a hope that we could live easier on the sunset side of life. I have 40 years of stored energy in this ranch and it is the best in the country if properly managed.